For this month’s Kulinarya Cooking Club barbecue theme, I decided to tackle the mother of all Filipino chicken barbecue traditions: chicken inasal. In my quest to perfect my version of inasal, I barbecued it — to the delight of my family — three weekends in a row, adjusting and changing the technique of the flavorings and marinade times. Somehow the weather seemed to disagree with me every time, raining on me twice and most recently, having me shivering — in late June, mind you — in 12 C degree weather while turning pieces of chicken for 45 minutes. Holland is definitely not Bacolod when it comes to the weather. That said, it was well worth the effort in trying to bring a little bit of the Philippines here, despite the crap weather. The first time I prepared the chicken, I only marinated it for an hour, per Marketman’s instructions (you can find his great post on chicken inasal on his website, Market Manila. He also links to a great article about Bacolod chicken originally run in the Philippine Star.) The flavor on the skin was quite good, but I found the meat to be a bit bland. I decided to compensate the next time by brining the chicken in water, sugar and salt overnight, then marinating for the last two hours. Somehow the sugar/salt combination created really strong flavor, but overwhelmed not just the chicken, but the marinade itself. Also essential to inasal is a native vinegar (I used an Ilocos-style cane vinegar, but palm vinegar is also nice), calamansi juice, and a basting sauce with achuete. My big problem is that there seems to be absolutely nowhere I can get calamansi where I live, and I once found achuete, but can’t remember where, so that was out of the picture. I squeezed in a bit of lime in place of the calamansi (blasphemy, I know), and skipped the achuete, just adding a bit of pimenton to the butter/oil basting sauce. (I know Marketman says to use Star margarine for basting, but I just couldn’t bring myself to do it). My last tip is to use all dark meat if you can. 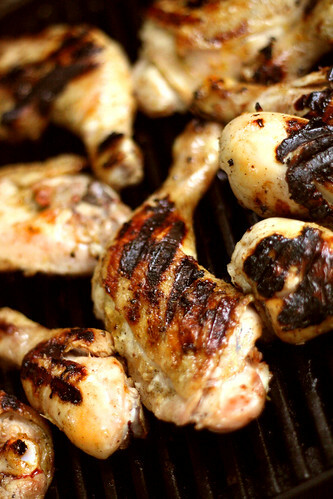 It won’t dry out, and it tastes worlds better on the grill than chicken breasts, which seem to instantly evaporate their juices on the grill and end up tasting like marinated cotton. A whole bunch of chicken thighs and drumsticks would be perfect, especially drumsticks because they have a nice meat-to-surface-area ratio. And by the way, the skin is amazing. But how could it not be? You’ll have spent 30 minutes basting it with butter. 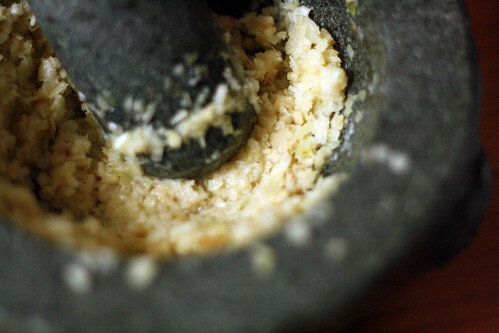 Combine the lemongrass, garlic and salt in a mortar and pestle, and pound into a paste. Add the vinegar, calamansi juice and several grinds of black pepper to the paste and mix well. Set the chicken pieces in a large ziploc bag and pour the marinade over them. Marinate (shifting around after a few hours) for about six hours. When you are ready to grill, get the grill ready and prepare your basting sauce. Melt the butter in a saucepan, add the oils and plenty of black pepper and mix well. Set the chicken on the grill over a fairly high heat, turning so they don’t burn, but brown on all sides. Set the chicken on a cooler part of the grill and baste with the butter sauce every ten minutes or so. The chicken should be cooked through after about 30 minutes. To make sure it’s cooked through, the meat should be 170 degrees F (76 C) internally when tested with an instant-read thermometer. Serve with lots of rice. You are too good to be tackling chicken inasal! These look great and I might even try this. I’m sure you have perfected the recipe – after 3 go’s! This look absolutely perfect! WOW! Fantastic photo of the bbq chicken!!! Hats off for persevering!!! 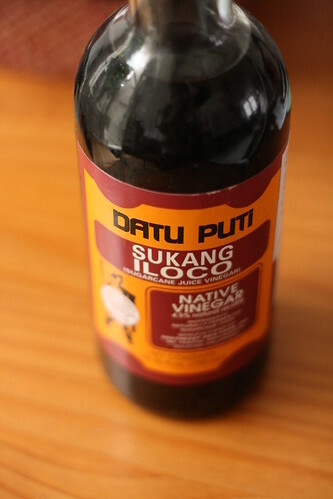 Datu Puti vinegar in the marinade … I’m in! Bookmarked for the next cookout. Your inasal looks good. I did the same and we basically have similar ingredients. It difinitely didn’t have sugar. Now i want to make this again. That looks great. I love the thought of using the whole chicken. I’m so used to filipino bbq on a stick or just in pieces. It is great! 45 minutes is truly a long time but I can tell from the picture – so worth it! Where did you manage to get the suka? Mmmm… Eager to try this recipe. Once again, without fail, you have managed to make my mouth water with your crispy waffle recipe posting. I’d definitely eat lots of rice with this! WOW chicken inasal, I have yet to tackle this so thanks for doing all the R & D for us. Definitely going to make for our bbq grilling. I’m late to the game (as usual). I’ve had chicken inasal before, with mixed reviews. But I’ve never tried to make it. I love the flavors in your marinade and basting mixture, and I think it’s about time I tried making it myself. This looks delicious! your recipe looks and tastes good. love to try. I agree, the use of Star Margarine is not done with chicken Inasal in Bacolod. I think they mistook achuete oil for star margarine because of its color. What is essential in making authentic chicken inasal is the use of tuba vinegar (fermented red orange juice tapped from the coconut heart). This is not the same as white vinegar from Luzon which uses fermented coconut juice. Sukang Iloko is from sugar cane I think. But I guess it will do for lack of getting the real thing.